This article is a short summary of Mario & Luigi: Partners in Time. 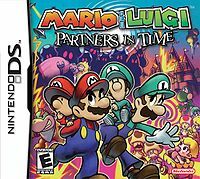 Mario & Luigi: Partners in Time is the second game in AlphaDream's Mario & Luigi series of role-playing games in the Super Mario franchise. TWICE THE BROS, TWICE THE INSANITY! And you thought their LAST adventure was hilarious? Now the Mario bros. are teaming up with their young selves on a quest of lunitie proportions. Control both sets of bros. in this action-packed role-playing game as you explore the very fabric of time and take on an evil alien entity known as the Shroobs. Use both screens and study the land, keep track of both pairs of bros., and maximize combo moves in battle. Dodge attacks then use items like Red Shell to team up all four bros. for super moves. Twice the bros., twice the insanity! And you thought their last adventure was hilarious? Now the Mario Bros. are teaming up with their young selves on a quest of lunatic proportions. Control them in this action-packed role-playing game as you take on evil alien entities known as the Shroobs. Many years ago, the Shroobs, a species of aliens, find the Mushroom Kingdom on a distant planet and head to invade it to replace their dying world. During this time, Baby Bowser is trying to kidnap Baby Peach as Baby Mario and Baby Luigi defend her, but they all evacuate when the Shroob forces start to attack, heading to Baby Bowser's castle. In the present, Professor E. Gadd has invented a time machine, and Princess Peach, Toadbert, and Toadiko test it by traveling into the past. When the machine returns, however, it is occupied by an alien creature. Mario, Luigi, and the rest of the group in the castle find a time hole that has appeared in the castle garden, and Mario and Luigi use it to travel to the past to find Peach. After they are defeated by the Shroobs, they are saved by the babies, but are shot down near Baby Bowser's castle. Inside the castle Mario and Luigi team up with their baby selves and find a shard of the Cobalt Star, the star powering the time machine, and head back to the present with Baby Peach and Toadsworth the Younger. Mario and Luigi as well as Baby Mario and Luigi must use the Time Holes to travel back in time to new locations, find the rest of the Cobalt Star pieces, save Princess Peach, and defeat the Shroob invaders in the past. This page was last edited on 25 June 2016, at 17:14.